How to Take Good Notes in College Classrooms | Go From Stress To Success! I recently had a coaching client who was getting ready to go to college, but struggling with one of their high-school classes. No matter how much we went over study tools or test preparation practices, they were consistently getting low grades on quizzes and exams. It turned out they didn’t know how to take good notes in class. And they also didn’t understand that class notes are one of your best study and review tools – but only if you know how to take them. Aha! A little more discussion revealed that this student didn’t understand how to take good notes in class, or how to use their notes once they had them. They often missed important information while trying to copy down every single word the teacher said. Of course they found note-taking frustrating! How about you? Are your notes okay, but not great? 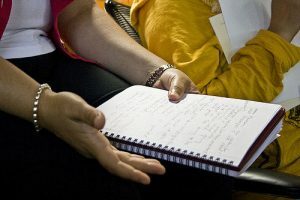 Do you need help with how to take good notes in class? How do you even know if you have this problem? They’re scribbled, not written. Or, they’re typed, and the typing is just paragraph after paragraph of the teacher’s lecture, written down word-for-word. They’re taken on a computer, not by hand. They’re full of examples, but light on terms and definitions. They’re written with complete words and no abbreviations. There’s no space left to make notes or clarify anything. If this is what your notes look like – and they probably do – you might need some help. Notes that are scribbled, or walls of text, or crammed together on the page are not going to help you study. If anything, they’ll probably discourage you from trying! Here’s the five steps you must take when taking notes in class, if those notes are going to be useful to you later. Review the Material – Before you come to class, you need to get familiar with the material. If there’s a book chapter or an article to read, read it and make notes of the important points. If there’s an online video or podcast to watch or listen to, do that before you go to class. You will have far less trouble taking notes if you’re already familiar with the terms that the lecture is going to cover. Important Terms List – Before you go to class, make a list of the important terms you find in the readings or videos on the first blank pages in your notebook. Leave some space for the in-class definitions of those terms. Don’t try to fill in the definitions during class – but have the list ready. It will help you identify any gaps in your notes once you’ve taken them. Write by hand – Believe it or not, this increases retention, and it also means you’re going to have to write down what’s actually important, instead of just transcribing every single word the professor says (something you should not do). Writing by hand also allows you more flexibility. You can draw a diagram if it explains an idea better than words, for example. Use a clear, legible hand (print, if necessary) so that you can read your notes later on. Part of how to take good notes is about what you write down and what you leave out. This is a skill set, but knowing about it makes it much easier to learn! Abbreviations are your friend. Some common abbreviations are b/c for “because,” w/ for “with,” “b4” for “before,” and “p.” for “page.” As long as you know the abbreviation, don’t hesitate to use it! Abbreviations are a form of shorthand; they allow you to take notes much faster while still understanding what you meant when you re-read them later. ex. w/more pps avail., u get more info, b/c u know b4 u start u can cover it all. A Pinterest board with lists of common abbreviations can be found here. Leave space so that you can write in clarifications, ideas, questions and definitions later on. One way to do this is to divide your paper into thirds, with the right-hand two-thirds being used for class notes, and the left-hand third being left blank to allow you to write in clarifications, notes, and so forth. (Just fold the paper to create a crease line, and stay on the right-hand side of the line.) Another way is to write “double-spaced;” leave a blank line after each line you write, so there’s room for notes and expansion. However, you should avoid writing down examples, unless they help you understand a concept. Also, avoid writing down every single word the teacher says – a word-for-word transcript is not what you’re looking for here. Remember, how to take good notes is as much about what you leave out of them as what you put into them. After class is over, take a half hour to an hour to go over that day’s notes, while the lecture is still fresh in your mind. This is one good reason to leave space – so you can write in clarifications and definitions that might not have made it into your notes. You can also move definitions from your lecture notes into the list of terms you made before class started. After you’ve filled in the holes in your notes, spend some time each week rewriting them. The notes we take in class are never organized, even if we use an outline format, because teachers do hop all over the place in even the most organized and planned-out lectures. For example, a classmate might ask about a concept the teacher covered ten minutes ago – so now your notes are going to be out of order. If the teacher has to hop from topic to topic, it’s inevitable that your notes will do the same thing. Those kinds of disorganized notes aren’t going to help you study. Another reason to rewrite your notes is that the teacher’s organization of the notes may not be the one that works for you. For example, your history teacher might put their lecture about the Revolutionary War in order of chronology (the dates) but for you, categorizing things by the type of event, or by the people involved in the event, might make more sense. Finally, interacting with the course material is a form of studying. Rewriting your notes makes you interact with it directly, as you refine, reword, clarify, and organize the information you got in class. If you follow this process of taking course notes, you’ll find that your notes become a lot more useful and a lot more helpful. Practice taking notes with your book and other course materials first, then move into the classroom. You may find that your new methods of note-taking cover a lot more ground than you thought they would! Posted in Studying, Taking Notes and tagged blog, classroom, for students, group work, note-taking, notes, notetaking, taking notes. ← Academic Advisor, or Academic Coach?